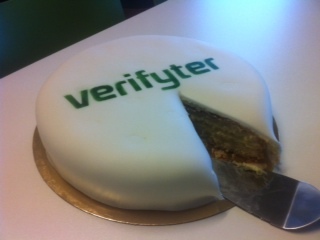 Today we signed-on yet another major semiconductor customer, one of Fortune’s 100 Fastest Growing Companies, something we celebrated with a Verifyter cake. Verifyter was voted the best VC pitch by the jury at the dress rehearsal at Vodafone Xone Ventures and Labs (Redwood City, California) ahead of the Telecom Council Investor Forum. Verifyter has been selected as one of the companies to present at Meeting Telecom Investors in Silicon Valley Nov 29th-30th 2012.